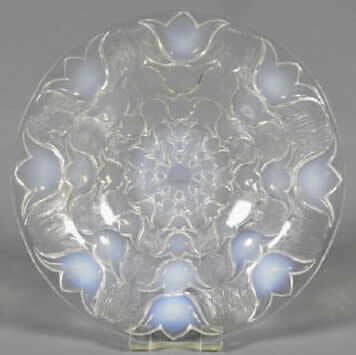 Rene Lalique Bowl Campanules: An apparent re-offer from April 14, 2018. Now Lot 119 Est: CAD800 - 1200. 11 and 3/4 inches wide by 2 and 1/2 inches wide opalescent glass decorated all-over with bell flowers R. Lalique Bowl in the coupe-ouverte form. Lot No. 149. Est: CAD2000 - 3000..